First Attempt: 2016 winter - 2017 summer project: RTK type system for auto-steer for under $600. Payback desired: Accurate steering while planting so my fields can be sidedressed with fertilizer later. Also, I would like to have my cousins strip-till fertilizer in the fall so I can plant on top of the fertilizer next Spring. My current auto-steer drives across the field pretty straight but pass to pass changes from the perfect 30" gap. 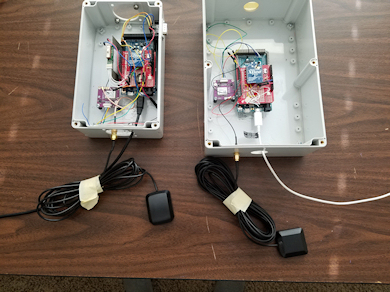 One box is a stationary base station, the other a mobile or rover. The base station is set over a fixed position like a fence post. The antenna on the mobile unit is attached to the top of the tractor cab. As the latitude and longitude vary because of atmosphere and satellite conditions, the base unit sends corrections to the mobile unit which feeds the GPS data to the auto-steer control box. Current status: The technology works. The programming works. 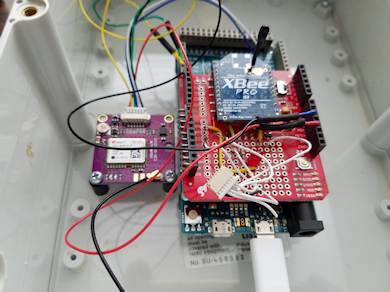 The Xbee radio transmitter and receiver work. My Ag Leader OnTrac 2 autosteer accepts the GPS signal. Although the U-blox NEO-M8N-0-10 GPS modules seem to stabilize to less than 1 meter precision, they don't seem to be able to vary their latitude and longitude the same between the two units making the corrections unreliable. Attempt 2: After I started this project, the U-blox GPS company created a similar setup with new NEO-M8P modules. I ordered a C94-M8P evaluation kit with 2 modules, each containing the high precision NEO-M8P and a radio transmitter/receiver. As tested by me, the new module has much better accuracy. 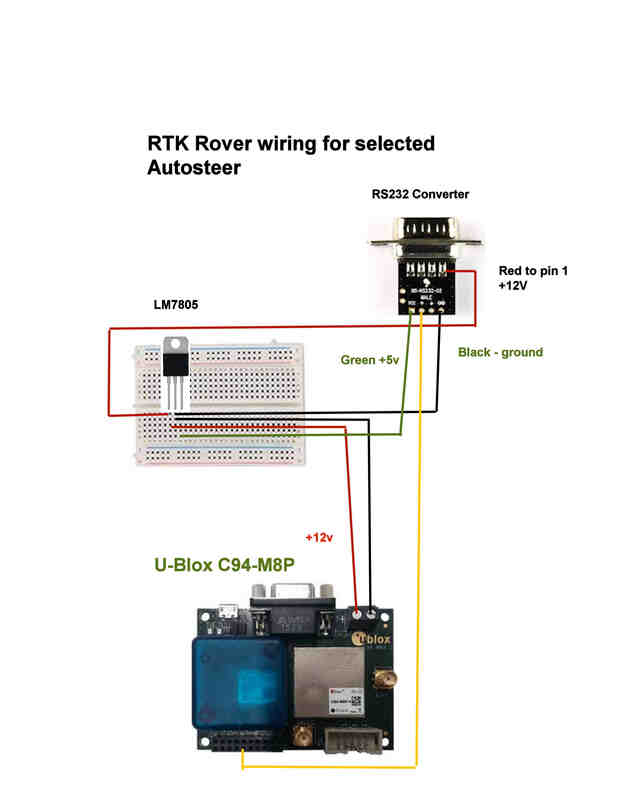 U-blox is promoting centimeter level accuracy using the base and rover technique. Output from their modules needed to be converted to the proper hookup for my ag autosteer system. As of November 7th, 2017, I have the RTK working well with my AgLeader OnTrac 2. This is a video I produced from my RTK test. Configuring the GPS modules and integrating them with the AgLeader took some doing. Although the U-blox documentation was good, there were a few settings which were not documented well and functions of the modules which didn't seem to work as documented and required work-arounds. If you are interested in trying this, contact me.